As the seasons change, so does the threats to your home’s roof. There are some steps you can take to protect your home from these threats which we’ll cover in this article. And if you need roof repair for any of the problems we’ll cover be sure to call us for roof repair in Howell Michigan. We offer full roofing services in Howell Michigan and emergency roof repairs as well if needed. Be sure to follow the tips in this article to help protect your roof from the threats of changing seasons in Michigan. As summer approaches many of the weather threats that were problems in Winter are no longer concerns. Winters can be a hard time of year for anyone. With the excess energy to clear the snow and the excess costs to keep your house warm, the last thing you need is to have any unexpected repair costs. And roof repairs in winter is especially stressful as you battle the cold and the snow to get the work done. To keep your roof from needing emergency repairs it is important to take the time to prevent possible damage by performing certain tasks. While there is no guarantee that it will one hundred percent prevent anything from happening while there is snow on your roof, it does greatly improve your odds of avoiding any problems. It is important to have regular roof checks to make sure there are no issues. But this is especially important before the winter starts so you know everything is in perfect order before the snow falls. While you can typically see missing shingles or other obvious forms of roof damage the rest of the year, during the winter you can have anywhere from an inch to two feet of snow sitting on your roof and hiding any problems underneath. Have a professional do both an exterior inspection and an interior inspection of your attic to look for any and all signs of trouble. You should schedule this no later than November so you can get the inspection done, as well as any repairs needed before any snow falls and complicates the project. Gutters are designed to take the water that is on your roof and transport it away from the home to a desired location. This is meant to keep water off your roof as well as away from the foundation. But in the winter the gutters can get filled with snow and debris and make it impossible for gutters to properly function. Without functional gutter the moisture can build up and freeze in the cold temperatures. This creates ice dams and can cause serious damage to your roof. To prevent this, it is important to check your gutters regularly and after snowfall to make sure there is no build up. This means both removing any snow and also checking the gutters for rust, cracks or any other damage to the gutters that could compromise their ability to do their job. Snow and ice may not seem very heavy in small amounts, but can weigh hundreds of pounds when gathered on your roof. This means that there is not only a constant amount of moisture sitting on your roof, but an incredible amount of weight to expedite any damage being done. To help keep your roof safe, it is important to remove snow and ice from your roof. There are snow rakes that can allow you to remove snow from the roof without having to climb up on the roof or risk injury. You can also install further insulation in the attic of your home to prevent the snow from melting to seep into any leaks or freezing into ice. If you’re concerned about your home’s roof it’s always best to get a full roof inspection done. At Livingston Roof Pros we offer roof inspections to help you determine just what shape your roof is in. We’ll also look for potential problems that may cause problems later. 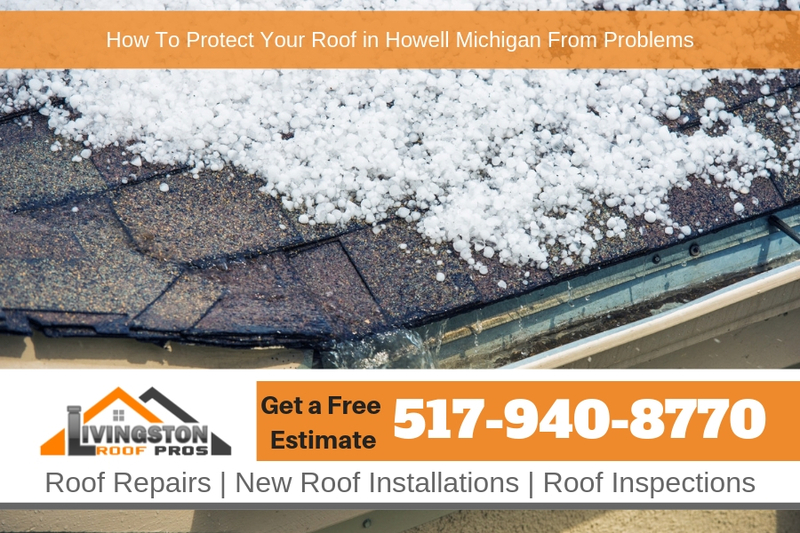 Call us today to get started and to schedule your roof inspection in Howell Michigan.